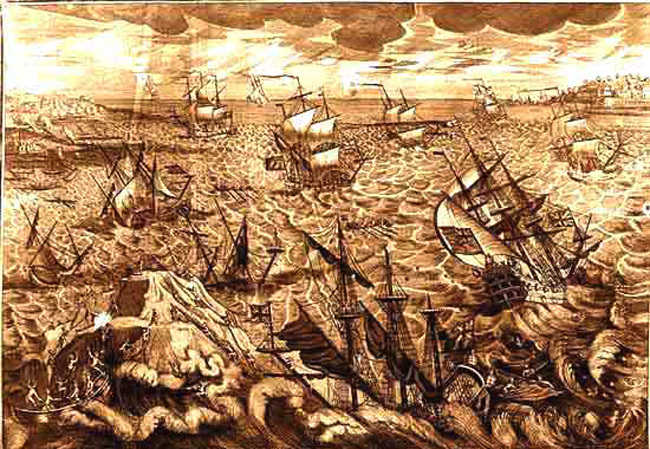 The Great Storm of 1703. Get your kite! 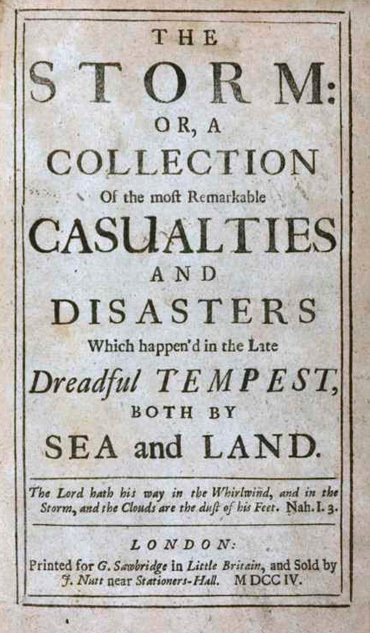 Unlike today’s storms, when we have advanced warning and can prepare for the worst, the poor souls of 1703 had very little idea about what was about to hit them, other than the fact that the country had been buffeted by a persistent south westerly wind for quite a few weeks. Sailing ships could not sail against it and had therefore been confined in great numbers to whichever port they happened to find themselves near. Inland though, people were largely innocent of the catastrophe they were about to experience. Furthermore, the Great Storm persisted not just for a few shocking hours, but for nine terrible days. How could anything, buildings, ships, farm animals or men stand up against well over a week of wind speeds like those recorded in the eastern part of the English Channel or East Anglia? They would have approached 100 mph for long periods. The inhabitants of London felt the first strong breezes during the morning of Wednesday, November 24th 1703, (December 5th 1703 in our current calendar). By four o’clock in the afternoon the winds had noticeably increased. In London, recently out of prison, Daniel Defoe, the journalist, pamphleteer, spy, trader, writer and author, of course, of “Robinson Crusoe”, had a narrow escape in the street when part of a nearby house fell down and luckily missed him. On Friday the 26th, the wind began to blow with even greater ferocity and when the Great Man checked his barometer, he found the mercury had sunk lower than he had ever seen it. After midnight the gale increased to such strength that it was almost impossible to sleep. The noise of the chimneys of surrounding houses crashing into the street made the whole family afraid that their own solid brick townhouse might collapse on their heads. When they opened their back door to escape into the garden, they saw roof tiles scything through the air, some landing thirty or forty yards away, embedding themselves eight inches or more into the ground. The Defoe family decided to stay in their house and trust in the Lord. In the aftermath, when the tide fell, the sailors of the wrecked vessels who were able to find a foothold on the huge sandbar, were all wandering around knowing that when the tide rose they were certain to be drowned. 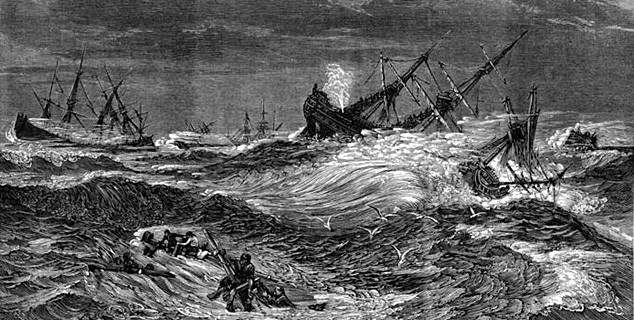 It was said that a man called Thomas Powell, a shopkeeper in Deal, organised the rescue of some two hundred of them. Supposedly Powell was so appalled by his neighbours’ reluctance to help that he gave them five shillings each for their support. Certainly, the greedy citizens of Deal were widely accused of being more interested in plunder from the unfortunate ships than in helping to rescue the crew members. 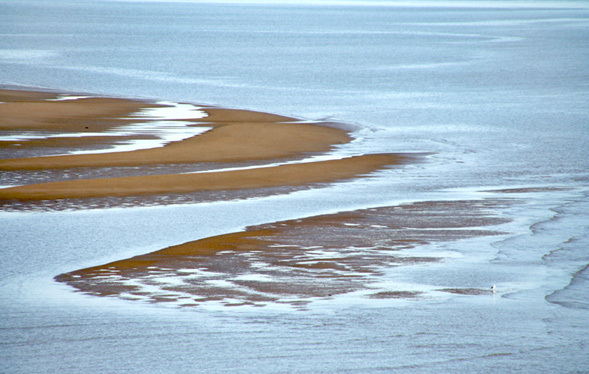 Indeed, some sources say that only three fortunate individuals survived the Goodwin Sands catastrophe. Supposedly, about 1,500 sailors in total were left to die. 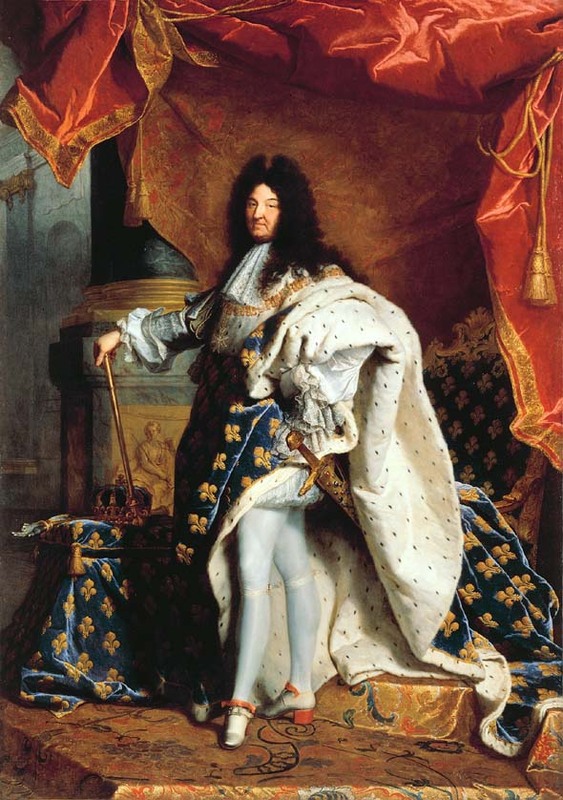 Its erection had been started a mere seven years before, and its light had been lit for the first time only on November 14th 1698. Now all six of its occupants were killed, including the brave builder Henry Winstanley. 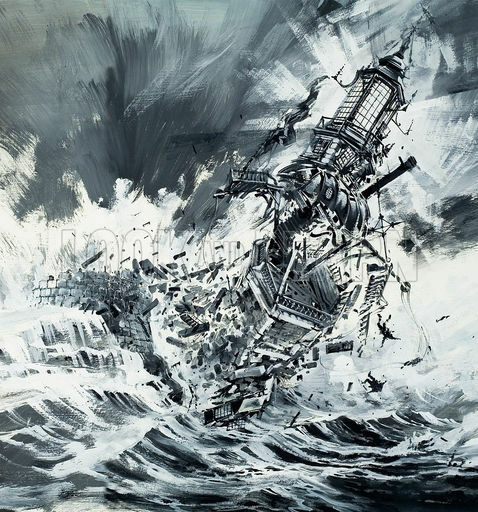 The Great Storm reached its appalling apogee, its catastrophic climax, during the following night, that of November 28th-29th (December 9th-10th 1703). 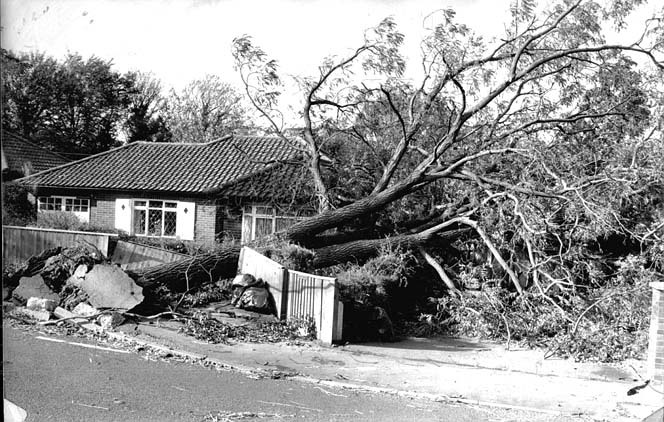 Between the south coast and the Midlands, entire villages from Northamptonshire in the north to Suffolk in East Anglia were devastated as the winds of the Great Storm rampaged across the country, striking hardest in the south and east of England, sending house roofs flying, flattening barns, razing everything in its path. Both men and animals were lifted off their feet and carried for long distances through the air. Roofs were ripped from more than a hundred churches, the lead was rolled up like a sheet of paper and dumped hundreds of yards away. Millions of trees were blown over or uprooted; knocked flat in their tens of thousands, they lay prostrate in rows like soldiers mown down in battle. It was said that more than 4,000 oak trees crashed down in the New Forest. An attempt was made to count the flattened trees in Kent but the count was abandoned at 17,000. The diarist John Evelyn lost in excess of 2,000 trees on his own Surrey estate. Every kind of building was totally demolished and salt spray was driven almost as far inland as Tunbridge Wells. Animals refused to eat the resultant salty grass. People could not decide whether it was safer to stay in their house and risk its collapse or to go into the street where flying tiles killed large numbers. In East Anglia the wind reached over 80m.p.h. and killed well over a hundred people. More than four hundred windmills were blown down. Many of them burst into flames because the friction of their sails spinning round at high speed caused their wooden machinery to catch fire. In Cambridge, part of St Mary’s Church fell down and the falling stones completely flattened the organ. It had only recently been installed at a cost of £1,500. Kings College Chapel was equally badly damaged with stone pinnacles toppled and many of the wonderful stained glass windows destroyed. In the capital, around 2,000 massive chimneys were blown over. The roof was blown off Westminster Abbey and the Queen, Queen Anne, had to take shelter in a cellar at St James’s Palace to avoid falling chimneys and tiles whizzing off the roof. Daniel Defoe told how the Reverend James King of London wrote him a letter about a chimney which crashed down and buried a maid. She was thought to be literally dead and buried, but she came out the following day from a small cavity in the rubble. Floods devastated the whole country, especially in the east of England and along the Severn Estuary. 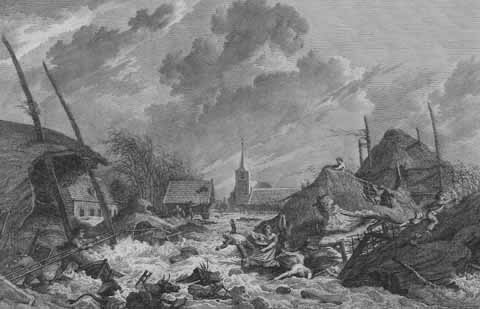 In the West Country in general, flooding was extensive and prolonged, particularly around Bristol where just under a thousand houses were totally destroyed. Hundreds of people were drowned on the Somerset Levels, where uncounted tens of thousands of farm animals, mainly sheep and cattle, perished. One lost ship was found fifteen miles inland. At Wells, Bishop Richard Kidder was crushed when two chimneys in the palace collapsed onto him and his wife, both peacefully asleep in their bed. Part of the Great West Window in Wells Cathedral was blown in and smashed to smithereens. At Fairford the church’s west window, facing the raging anger of the oncoming wind, bulged inward and crashed into the nave. In Wales, major damage occurred to the southwest tower of Llandaff Cathedral at Cardiff. 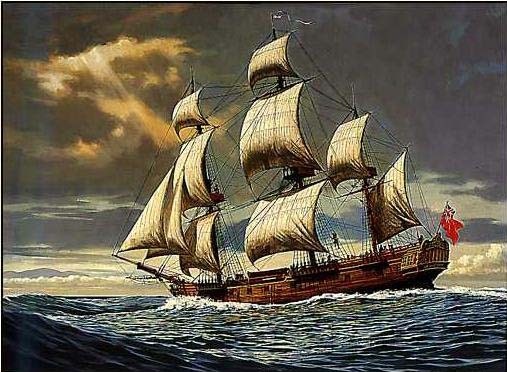 Daniel Defoe told the tale of the captain of a leaking ship who tried to escape what seemed to him at the time to be an inevitable death by drowning, and instead committed suicide—only for his ship to survive. One possibly taller tale related how a sailing ship at Whitstable in Kent was blown out of the foaming sea and then deposited more than a quarter of a mile inland. Conceivably this disaster became “national news” in a way that had seldom, if ever, happened before. It was just like a modern “big story”. 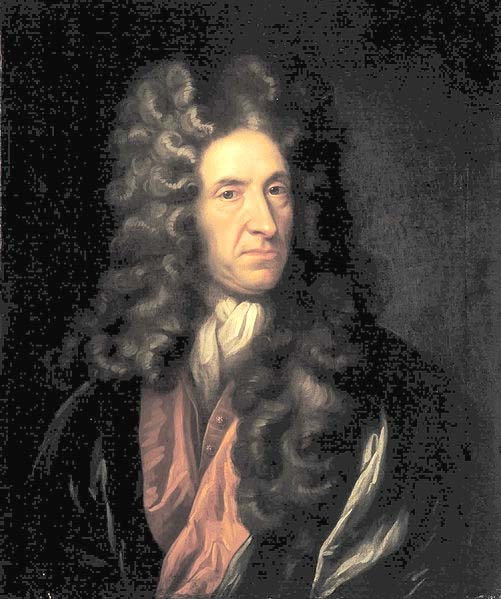 Daniel Defoe himself sought out testimony from as many witnesses as he could find. When the weather ameliorated, he the whole country assessing the damage. He then produced what was subsequently described as “the first substantial work of modern journalism”, a book of more than 75,000 words, which was called “The Storm”. 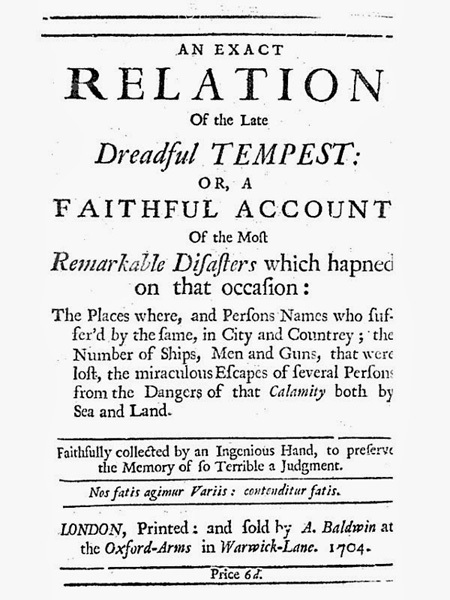 It was the first proper book of Defoe’s career.